When homeowner Jenny and Mike Sohu bought their four-storey, four-bedroom townhouse, Jenny already had an idea about the look. Lucky for her, her interior designer, Jen Sohu, who’s also her cousin-in-law (and her namesake!) got exactly what she had envisioned. 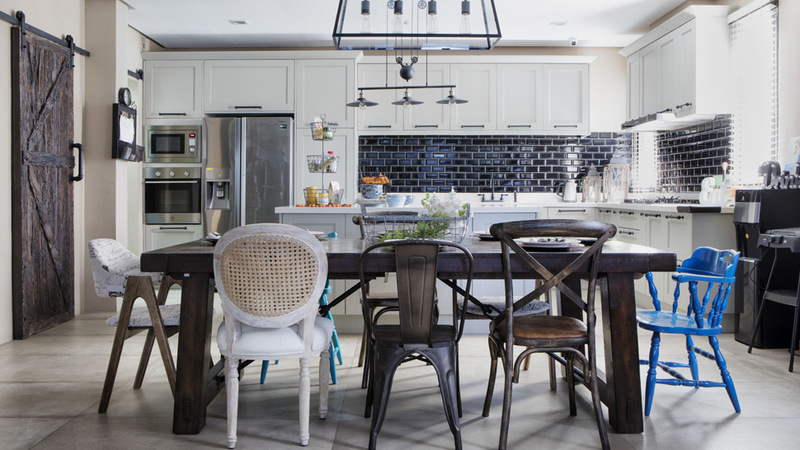 “She told me, ‘I want something rustic,’” says designer Jen of the theme Jenny wanted for her home. “I told her, ‘Stop right there. Gets ko na.’” Thus was the beginning of their harmonious relationship and how the Sohu home came to be. Upon entering, guests are greeted with machuca tiles on the floor, wooden planks with “laugh, say please, give hugs” printed on them, and a washed brick wall in the Sohu’s foyer. The wall of washed bricks continue on to the second floor where it serves as an accent wall for the wide, open space. This is where the living area and the kitchen are. “From the start, I imagined the living room to be the center of our family bonding activities. That’s why the space was made open and free,” explains Jenny. To achieve this, they had to do a re-layout: build a powder room in place of the guest room, extend the main kitchen, and add a “dirty” kitchen. Another flight of stairs leads to the third floor, where two bedrooms are found. The master bedroom, done in a relaxing palette of blues, whites, and browns, is the opposite of their son’s dark and cozy room. Like the second floor, this space went through a re-layout three times to accommodate a bigger walk in closet. The top floor of the Sohu home is where the girls’ rooms are. See how a delightful mix of colors and pieces can bring a property to life.